It’s trade deadline day. It’s 1pm as of posting this. All hell has broken loose. Cleveland is The Purge. Twitter is absolutely going to break today. But I’m saving all Deadline stuff for a Deadline Roundup at around 4pm. Before we get to the games, here’s the Kristaps blog I wrote yesterday. It was an emotional day, but I came out at the end with an optimistic perspective. My Beautiful Large Unicorn Son Kristaps Porzingis tore his ACL. Maybe the game of the year in Cleveland last night. Absolutely worth the ten minute highlight package rewatch. There were an NBA season-high 34 lead changes, creating a fantastically interwoven game flow chart. And an NBA record 40 (FORTY!) combined three pointers. Karl-Anthony Towns went for 30p/10r/2b while hitting all 6 of his three attempts and shooting 10-12 from the field. Wiggins (19p on 7-13) and Teague (14p/15a) both contributed. JR went for 20, hitting 6 of his 11 three point attempts. And Cedi Osman (9p/4r) came in for some HUGE minutes late in this game, both as the defensive sub for Isaiah and offensively down the stretch. 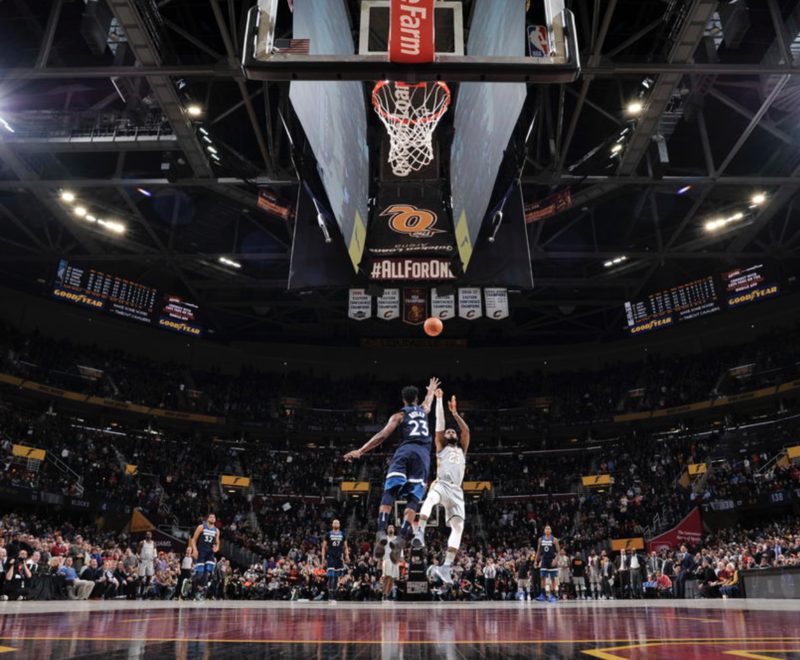 But the night obviously belonged to LeBron (37p/10r/15a with 5 threes on 16-22 shooting) and Jimmy (35p/5r/6a/2s with 4 threes on 14-21 shooting). Jimmy was absolutely awesome on both ends. Dude is just an absolute gamer. I’ve become a completely shameless Jimmy stan at this point, so this might sound absurd… but outside of LeBron, Durant, Kawhi, and probably Giannis I don’t know if there’s anyone I’d trust more than Jimmy in a series come May. I’m getting more defense than I get with Steph and less instability than I get with Harden or Russ. The night belonged to LeBron, yes. But goddammit Jimmy is the best. Five straight now (four with Blake playing) since the trade for Detroit. Blake (25p/3r/7a/2s) and Drummond (17p/27r/2a/2b/3s) continue to be AWESOME together. They’re dominating teams inside. And when they get the type of help they got from Stanley Johnson (19p/3s) and Ish Smith (15p/6r/4a) they really do look like on of the five best teams in the East. I didn’t think it would work. Four games in, I really might be ready to wave the white flag on that. Today they just added Jameer Nelson as a security blanket and traded for James Ennis, who gives them some much needed wing depth. They’re tied with Philly now for the eighth seed, but they’re also only 4 games back of 3rd seed Cleveland. 29 games left is more than enough time to make up some ground. Miami got 60 from Dragic (30p/4r/5a) and Richardson (30p/4r/5a). But even the best effort from most teams isn’t going to out-do the Rockets backcourt. Harden went for (41p/4r/6a/3s). Paul added (24p/7r/7s). And the Rockets held on down the stretch to be the second team to hit the 40 mark. Utah is on an absolute roll right now. That’s 7 straight, with three of those coming against the Warriors, Spurs, and Raptors. They’ve climbed themselves back into playoff race – just 2.5 games back from the eighth seed and 3 games back of 6th seed Denver. They’ve got Charlotte, Portland, San Antonio, and Phoenix heading into the break. No reason they can’t at least take 3 of 4 with how they’re playing. Maybe Ricky Rubio (29p/8r/3a/3s with 2 threes on 8-16 shooting) won’t keep posting 30 a night. But if he’s back to what he was to end last season and Gobert (8p/12r/2b) starts to really pick it up after the break? I’d be a little worried if I’m Denver, Portland, and New Orleans. Hard to find a funnier Prime Time back-to-back than what ESPN got last night. Game 2 is a 48 point washing by a Kawhi-less Spurs team over a Devin Booker-less Suns team. I’d venture to say this is the first time it’s ever been 100-50 in an NBA game. Absolutely wild. It was 129-79 with ten seconds left. I literally happened to look up at the TV for the first time in an hour at that moment. This is the play that prevented the Suns from the headline of “Phoenix Got Fifty Pieced”. Almost makes up for the whole night. The Indiana-New Orleans game last night was postponed because of a leaky roof. They haven’t announced a make up date yet. And that’s it. Happy deadline day. See you back here in a few hours for a full recap of everything from today.